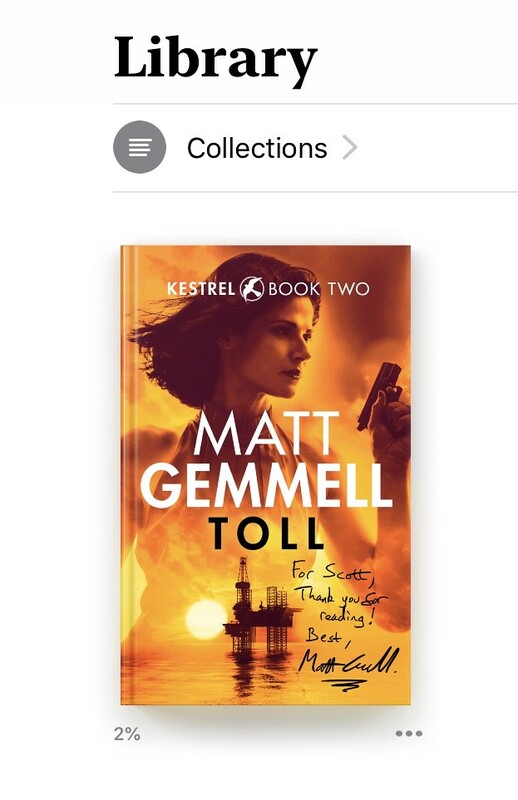 I recently wrote about how I’m offering autographed ebook versions of my novels, alongside autographed paperbacks and of course the regular retail editions in both print and digital formats. 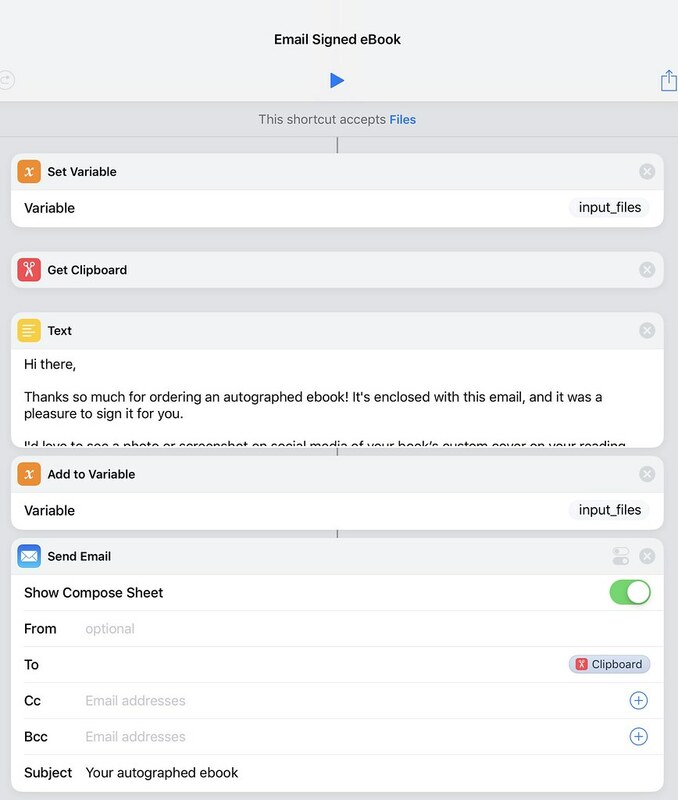 In this article, I’ll briefly describe my iPad-based workflow for making those bespoke ebooks. Because I self-publish and thus generate the ebooks myself, I have full control of the process. My iPad Pro with Apple Pencil is the idea tool for not only inscribing and signing book covers in an efficient (and eco-friendly!) way, but also actually building and delivering the resulting beautiful personalised digital novel. First, I have to do the actual signing. I use the Apple Pencil for this, and the regular Photos app. I have an album that contains just the clean cover art for each book, and when I get an order, I duplicate the relevant cover. Then I open the Markup interface to actually sign it. I like using the medium thickness of pen, since it’s a good approximation for my beloved Staedtler pigment liners (which I use to sign paper books) but is also thick enough to show up really well on e-reader apps and devices. 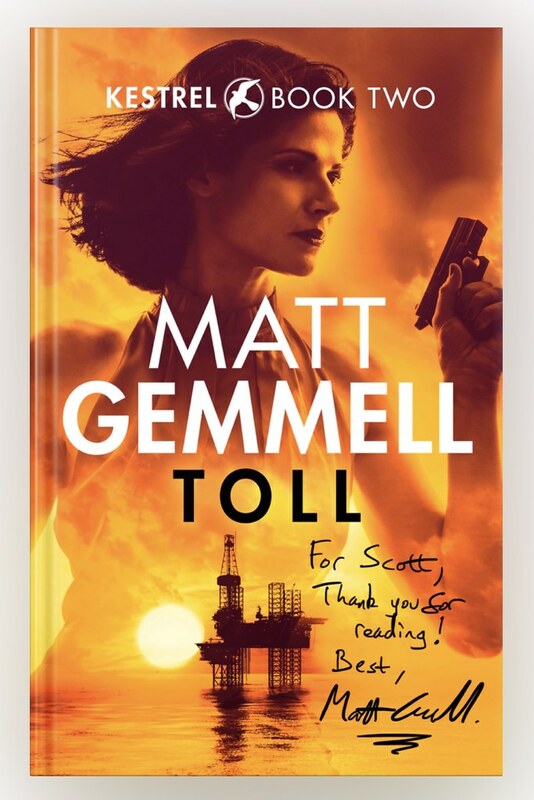 A huge bonus is that I don’t need to worry about accidentally bashing a paperback’s cover, or messing up an inscription or signature: I can just tap undo (or use the eraser) and try again. If I’m just signing a couple of covers I’ll lift the iPad into my lap, but if there are quite a few to sign then I set it up as an easel, with a Jetech stand. If you look along the bottom of the screen in this next photo, you can see all the covers queued up to be signed; once I’ve done one, I just swipe to the next and continue — much faster and easier than with paperbacks! 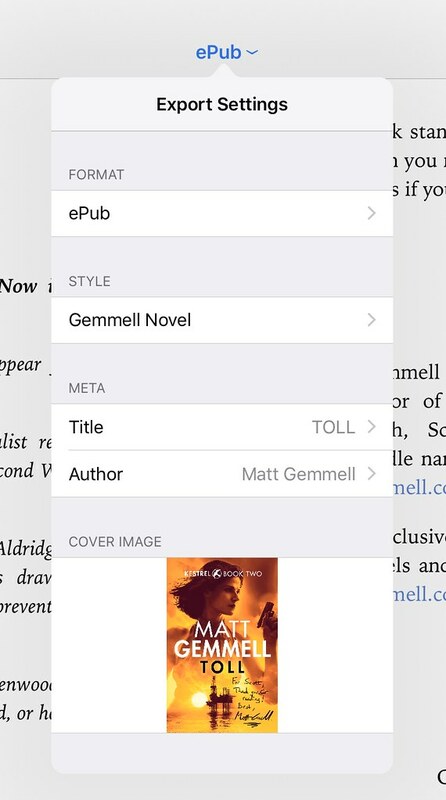 Next, I open the novel’s project in Ulysses, add the custom cover via importing it from Photos, and build the ebook. It gets saved to Dropbox, which is where I keep all my work. I then switch to Dropbox and export the ebook, triggering a shortcut I made in Apple’s Shortcuts app, which was previously called Workflow. 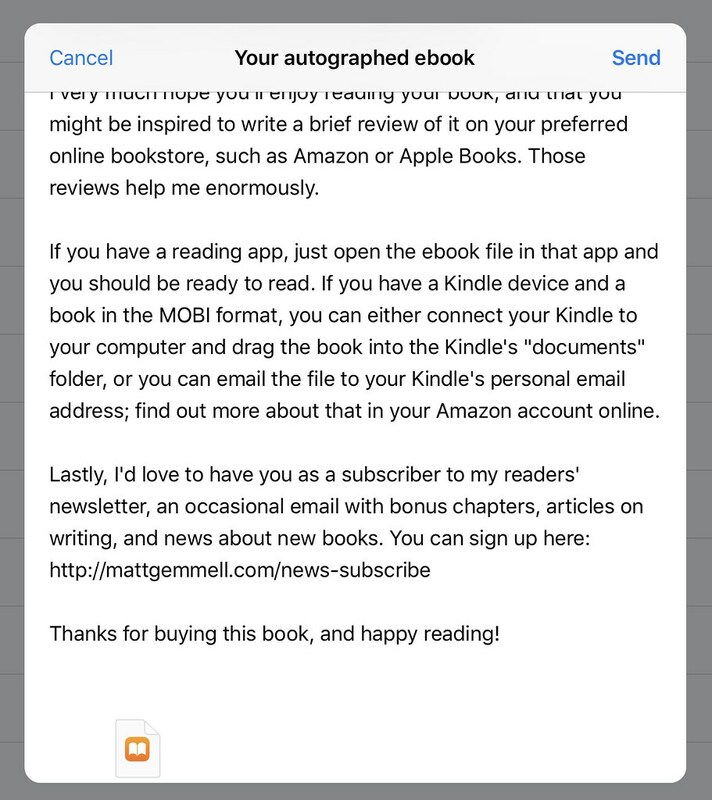 I have the customer’s email address on my clipboard at this stage, and the shortcut just takes both the email address and the ebook file and makes a new email with suitable subject and content, addressed to the customer, and with the ebook attached. I tap Send, and I’m done! 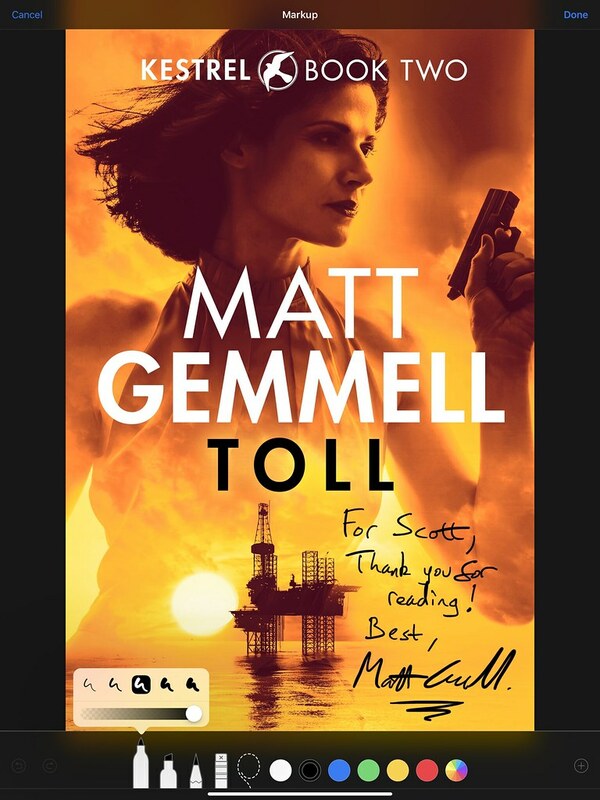 The end result is a beautiful and unique copy of a novel that’s in a convenient ebook format, but is still personalised with an inscription and a signature. I do every one of them by hand, including my signature every single time! 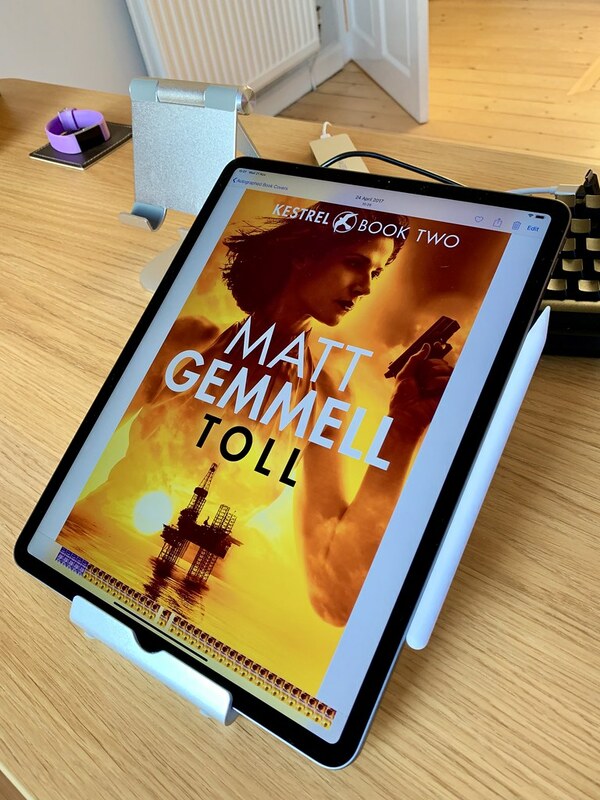 When the bespoke ebook is loaded into an e-reader app or device, like Apple Books or a Kindle, the custom cover shows up right in the bookshelf. I think they look brilliant, and I love the idea of taking personalised and autographed books into the digital world. For me, the iPad Pro and Apple Pencil made this process not only possible, but also feasible for a one-man indie publisher and novelist.